......in the meantime a sock for me, my knitting is very colour co-ordinated at the moment! *when you are not quite sure if you have enough yarn to complete a project. Gorgeous projects. You are right about the cream for the fair isle and I love the purple Celtic knot(?) running up the leg of the sock. Thank you Kim! 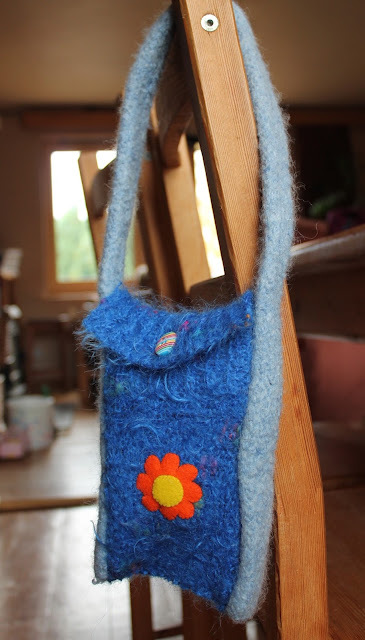 The bag was fun to make, I made one for myself over the summer perhaps I should share that too? It is so easy to be over ambitious isn't it, when we want to make gifts for everyone! All your yarn colours are wonderfull. Love that sock pattern, I need to move out of my sock comfort zone and try something different like cables. Can't wait to see the finished quilt - is a a log cabin design? You are so right, it feels like Christmas round the corner - and it is! We are totally in the mood for baking and making presents and will savour the next weeks! Your socks are beautiful - and all that lovely yarn! And I really like those little red stars too! Thank you, Christmas always seem to arrive quickly once November has started! You have lots of nice projects going on! The sock pattern is really pretty!! You've got some wonderful projects on the go and I'm looking forward to hearing more about the story sack, you've made some fabulous ones in the past, I think they're such a good idea. Love that house fabric too. I am looking forward to getting started on the storysack, I do love making them! All the yarn looks so lovely! Happy crafting! Aw thanks Karen, hope you get all your gifts made in time! So do I, I sat and sewed and stuffed three yesterday whilst the children were in a French class. They are a good portable project! 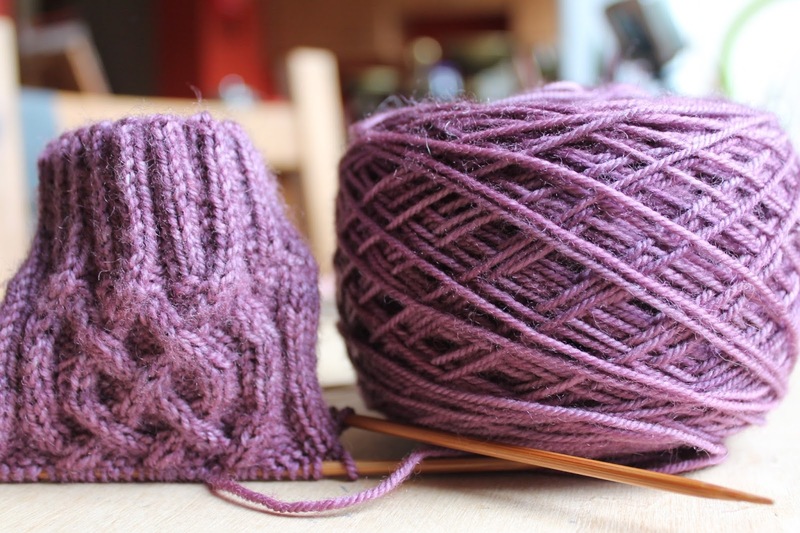 Your lilac sock yarn is beautiful and I happened to just have finished a hat using the same cable pattern! Ever since I completed the cardigan for my daughter that uses cables to make the owl pattern, I am hooked on cables! Cables are great aren't they, they work with all yarns! yarn chicken! haha, i like that. i always forget the xmas frenzy until someone mentions it. we don't do xmas at all, so the idea of spending 5 months making gifts is astonishing to me. whatever the reason, i love your dedication to making before buying. and adore the sock colour. Thank you, I had fun making it. I am drooling over your projects :) so lovely and inspiring and inviting!. I knit all year round, sometime I knit something and then decide well this can be so and so's gift. And like now, I'm knitting specifically for certain people. Remember my kiddos are grown up!! I admire your skill in stitching, and your wisdom in trying to pace yourself realistically...[my dreams are usually grander than my achievements :) ] I am glad you are giving yourself permission to enjoy making something for yourself! I don't always get it right Gracie! I try and pace myself but am often to be found frantically trying to get it all done at the end! Thank you. I am busy and will be for a few more weeks I think! Your handmade gifts and projects on the go are all so very lovely - you will have some lucky recipients! I love your colour palate as well - beautiful! Thank you, you are right that you learn who to make for. Some are much harder than others so I usually buy their presents!